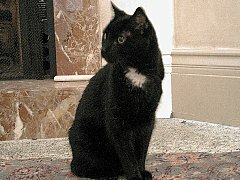 Captain Nemo has lived at the Golden Gate Hotel in San Francisco since he was a kitten in 1988. The daughter of the owners brought him there and they said, "You can't have a cat in a hotel!" It took only a few days for Captain Nemo to worm his way into their hearts, and their guests' hearts. Now they don't know what they would do with out him. He made his home in the room of a long-term resident for awhile, helping him out when he needed it. 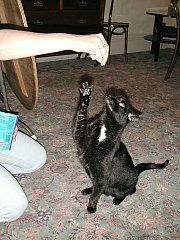 As a kitten, Nemo really livened up the place by generally zooming and tearing around the place. He also climbed the Christmas Tree. The first time he had to go to the vet, he hid for three days. They have no idea how he knew, since he had never been to the vet before. Captain Nemo loves the hotel and never goes outside or hunts for birds. You can usually find him lounging around in someone's room, or maybe you'll get lucky some night and he'll yowl outside your door for you to let him in! 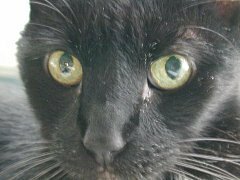 Note: Captain Nemo passed away in his sleep March 17, 2005. 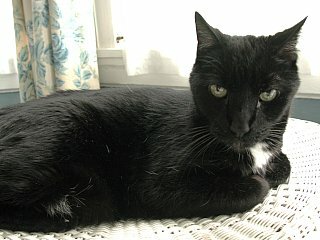 He lived a long, happy 17 years and will be sorely missed.